Hi, my name is Nikki. I received my degree in Dental Hygiene from the University of Pittsburgh in 2011 and have been practicing as a Registered Dental Hygienist since that time. 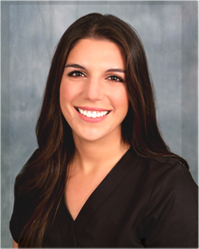 I joined Palacios Dentistry in 2012, and enjoy the friendly atmosphere! When I’m not providing dental care, I enjoy spending time with my family and friends, drawing and adding to my portfolio and decorating my home!